So you have an Omaha Central Alumn worthy of the Spotlight? Awesome! Andrew Binkley, former Omaha artist, has been a featured artists at a recent international art exhibition. Binkley was born and lived in Omaha till graduating from Central High School in 1996. The exhibition is SURVIVAL 8 Art Review being held within the Strzegomski Bunker (Air-raid Shelter) in Wroclaw, Poland and organized by the ART TRANSPARENT Foundation. 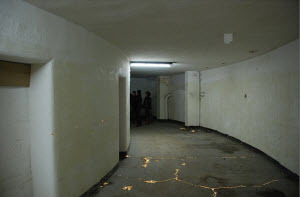 This picture is an interactive installation by Binkley entitled ‘Living Treasures’, in which Binkley invites the public to explore the interiors of the bunker and have an intimate relationship with the building, its history and fragility by painting with gold any cracks that they see throughout the surface of the bunker. Be a Central Booster! Show your Purple Pride & support Central High School. Looking for CHS or Alumni gear? We have you covered. Visit our store to browse all of the products we have to offer. Go, now! © 2010 Omaha Central High School Alumni Association. All Rights Reserved.